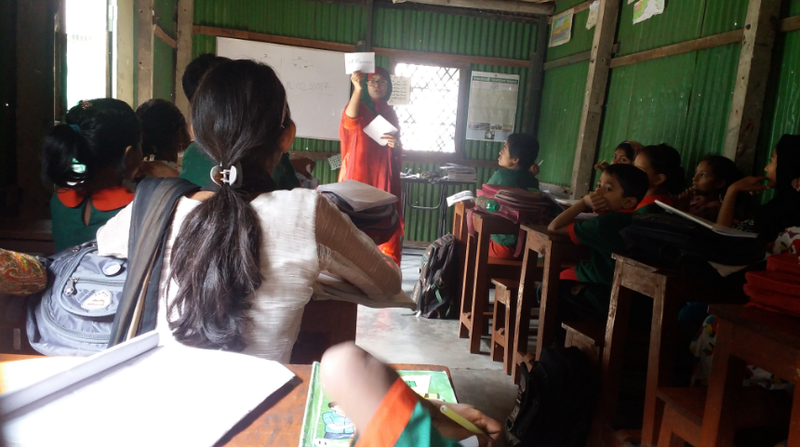 On February 1st, the pilot for Ready to Read – a collaboration between The No Barriers Foundation and Agami Inc. – began at Nandipara school in Bangladesh. Israt, a local, qualified teacher is our first hire and she has began teaching English to Grades 3, 4 and 5. Working closely with Kieran Roberts, Director of The No Barriers Foundation and a teacher in the UK, we have carried out reading assessments with each class. By recording this data and carrying out the same assessments again in mid-2017 and in December (which will mark the end of the pilot phase) we hope that we’ll be able to show clear pupil progress as a result of Ready to Read. The assessments have given us clear targets for each of the three classes and we’re confident these targets will be met; we’re working with bright, eager pupils who are keen to learn which will make our work much easier! These assessments have importantly allowed us to identify some gaps in the phonetic knowledge of some children so we are also including some time to revise phonics in future lessons. The No Barriers Foundation is in the process of sending supporting materials for teaching phonics and this will be crucial in improving the pupils’ ability to read English. By continuing these rigorous methods of assessment and using this to inform future planning, we’re ensuring high quality standards of teaching which is nothing less than these children deserve. We’re really proud of the start Israt has made and the impact Ready to Read is already having. We’ll be providing regular updates on the progress in Nandipara and our future plans for expansion. The seeds are being planted now and we’re excited to watch them grow!